This datafile is designated ETOPO2v2 (June, 2006). 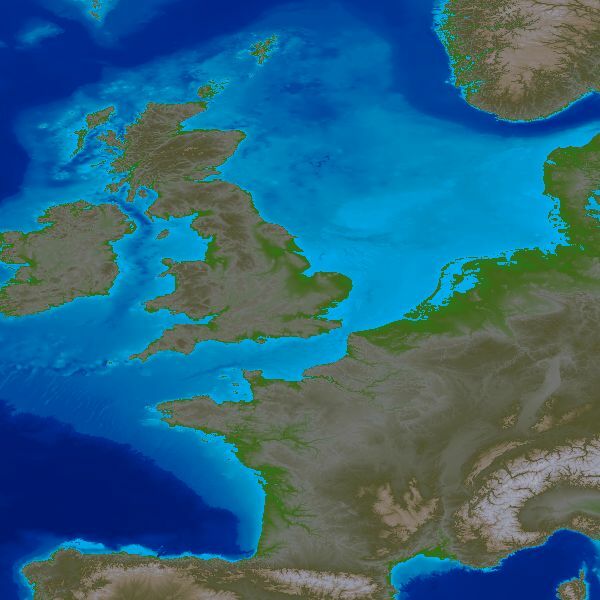 Click the map of the North Sea opposite to see the full resolution of ETOPO2 Mapper. ETOPO2 Mapper allows the user to select from a wide range of predefined regions of the Earth as well as enter coordinates for a user-defined area. A range of colour palettes for both land elevation and bathymetry are available. This is a completely new version of the program, coded in Delphi (2007). Full Earth maps may be manipulated using David Taylor's GroundMap software to create globes of the world from any aspect, as illustrated opposite. 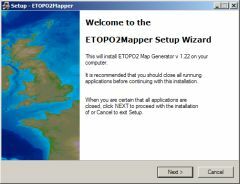 ETOPO2 Mapper has been designed under Windows 2000, and also runs under Windows XP. It requires a minimum 1024×768 PC screen. Note: This is not a link - you have to type this address into your e-mail client.